Hood River  is a city in Oregon on the Columbia River. Hood River is renowned for wind surfing. Drive or take a bus from Portland. You can also take the train from Portland to Bingen, Washington just across the river. The drive from Portland through the Columbia River Gorge is outstanding, so if possible, rent a car. It's easy to walk around downtown Hood River, but you might want a car to check out some scenic areas nearby. There are shuttle and tour services offered by local businesses, check out the Hood River Chamber's website to explore the possibilities at [hoodriver.org]. Hood River is a cool little town. There are great dining options, lots of shopping, some sweet little hotel/motels; with lots of family-friendly opportunities. Breathtaking views of the Columbia River Gorge, quaint old orchards with Mt. 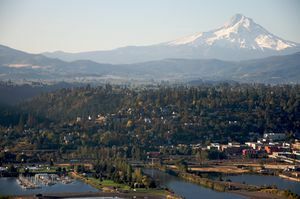 Hood as backdrop, acres of world-class wine-producing vineyards, waterfalls, local art galleries, and historical byways are just the beginning of what visitors will experience in Hood River, OR. Take a ride on the Mt. Hood Railroad through river valleys, orchard land, up to mountain vistas, and back while enjoying a gourmet meal. Come during the winter to see the snow-capped cascades in all their glory, or tour the Fruit-Loop if Fall colors are your fancy. Springtime boasts fruit blossomes noteworthy by some of the best photographers in the region. During the Summer a whole day can be sent sitting down at the Marina, marveling at the athletic abilities of Wind and Kite-Surfers in this wind-capital of the world. Hood River is truly beautiful every season of the year. Downtown Hood River's downtown area is set up for shopping. Locally made products, boutiques, sports-wear, art-galleries; anything and everything you never knew you could get in Hood River. Sports Hood River offers several sports-equipment sales and rental shops from mountain biking to windsurfing to stand-up paddle boarding to fishing, every level of experience is welcome. The Heights This area, above downtown, boasts many local restaurants, unique shops, a grocery store, services, and everything for locals and visitors to do daily life. The Fruit Loop Stop by the Hood River Chamber (720 E Port Marina Drive) to get a Fruit Loop map. Drive the 35-mile loop of locally grown apples, pears, and purchase fresh fruit, honey, lavender, and so much more. This page was last edited on 19 September 2012, at 21:15.